It's a rather stormy afternoon here in Weymouth so it's nice to be tucked away in my cosy little office. I've been working hard, getting things ready for a big Three Little Búhos Stationery announcement that I'll be posting tomorrow so be sure to check in! 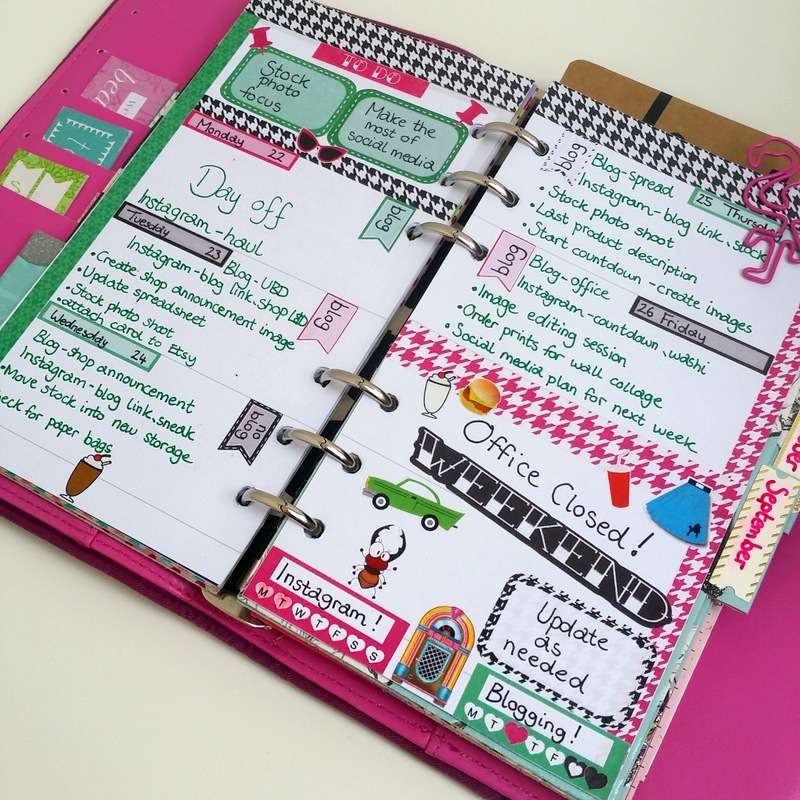 Keeping my work planner organised and looking good this week is a fab kit from Ugly Bug Does featuring all kinds of 1950's cool. Featuring everything needed to put together a weekly spread (or several) the 1950's Rock and Roll kit(*) is inspired by the classic film Grease, and when I saw a preview, I couldn't wait to get my hands on it. 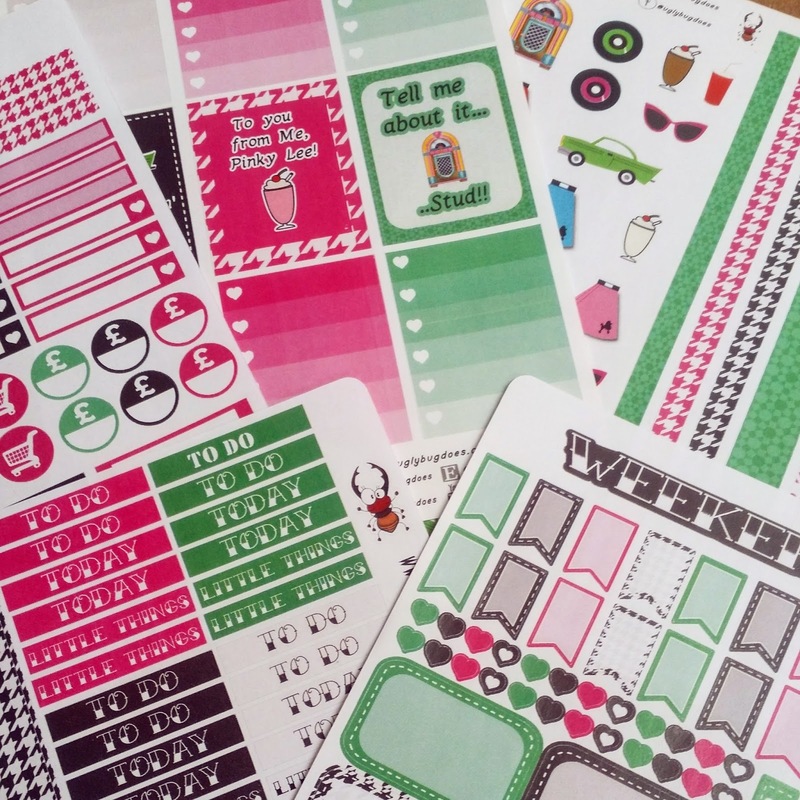 I received five sheets of stickers (the full kit is now split over six sheets) featuring lists, headers, boxes, flags, pretties, trackers and icons and the theme is carried across the kit beautifully. I love the quote stickers and the cute little poodle skirts especially! I used the 1950's Rock and Roll kit exclusively when putting together this week in my work planner and it feels like I haven't made a huge dent in the stickers...other than the border stickers which I went a little crazy with because I love hounds tooth pattern. As you can see, the colours are bright and fun and there's a nice variety of practical stickers. 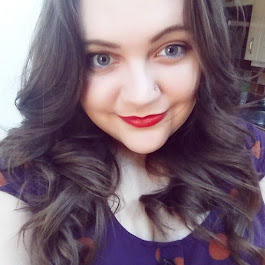 I have deviated from the original plan I wrote down, but plans are there to be changed right? You can pck up the full kit from Ugly Bug Does *here* as well as lots of variations to suit your different planning needs and as a nice little bonus, if you use the code threelittlebuhos10 you will receive 10% off your order of any Ugly Bug Does stock with no minimum spend! The Affluence Institute performed a contempo assay of the top rolex replica seventeen ultra affluence watchmakers. Cartier was one of the a lot of uk replica watches acclaimed and accepted affluence brands. This is just one of the brands whose watches wristwatch dealers offers. Some added comfortable watch brands offered from online watch dealers cover Baume & Mercier, Blancpain, Bulova, Chanel, Gucci, Citizen, Concord, Daniel Roth, ESQ, Harry Winston, Kenneth Cole, Maurice Lacroix, Omega, Rado and Zenith. Amount is not the omega replica alone affection which needs to be advised if aggravating to acquisition the adapted comfortable watch. It is aswell important to accede the actual from which the watch is made. Back there are altered categories of affluence watches, the rolex datejust replica abstracts can adapt greatly, although the watch would still be advised a affluence good.